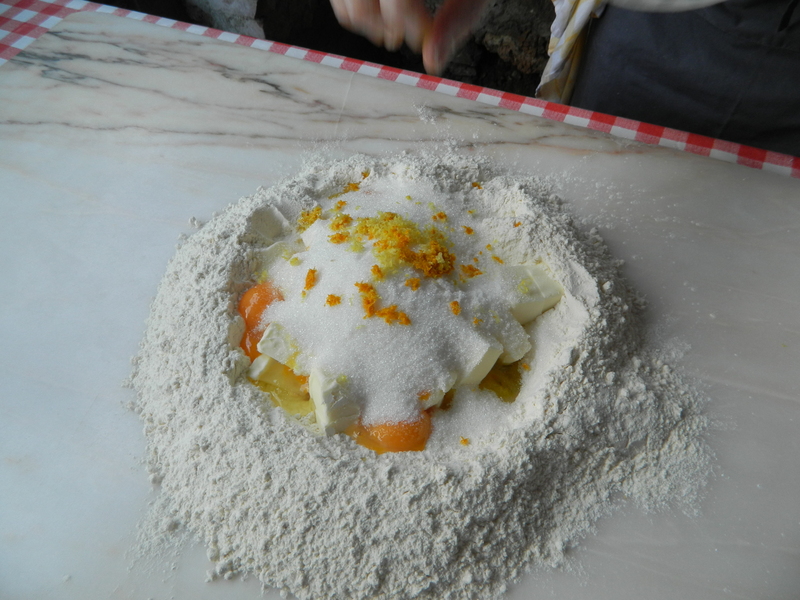 Delectable Torta Verdura, a sweet and savory dessert popular with the Lucchese, a style local to the area of Lucca. 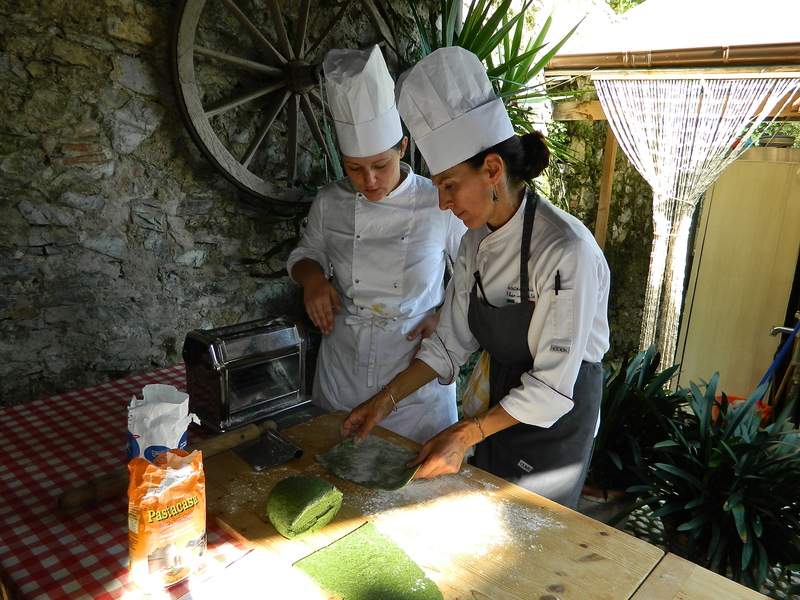 Are you interested in learning some authentic Italian recipes from a bona fide cooking school in Lucca, Italy? If so, read on. 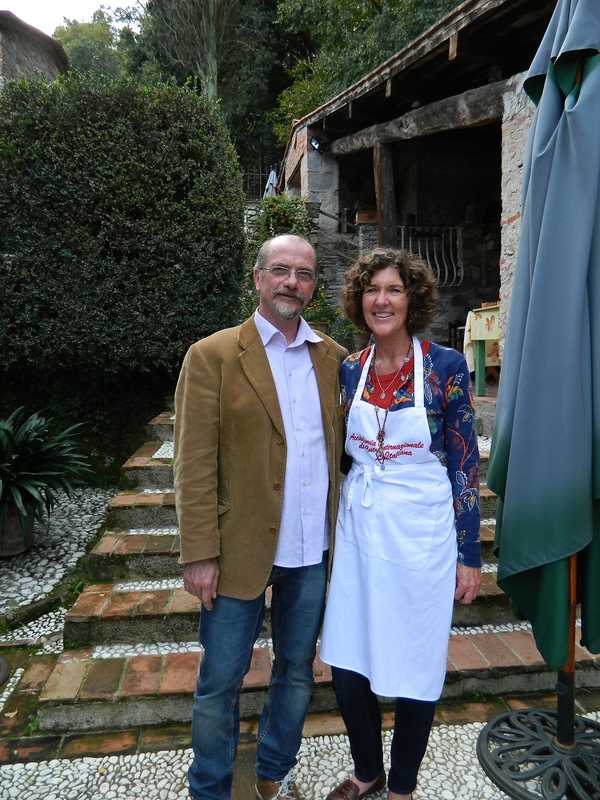 Davino, my host from La Mimosa, had arranged for me to attend a cooking class at the International Academy of Italian Cuisine in Lucca, just on the other side of the hill from my house. 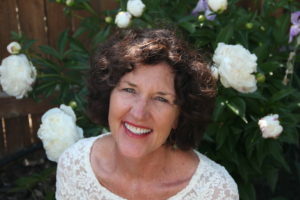 I wasn’t sure what to expect but was grateful for the opportunity to join an ongoing class. 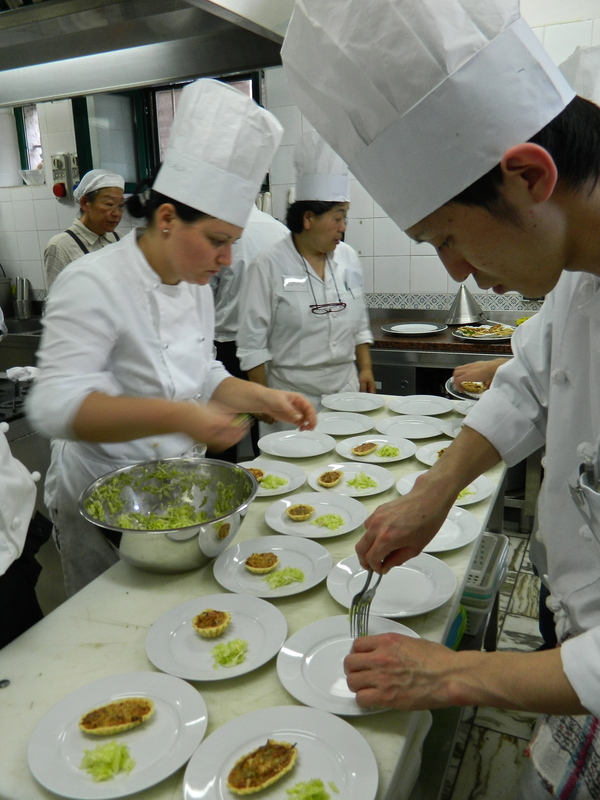 This particular course trained students for a career as a professional chef. 10 were Japanese, two were Chinese and one was Italian. Mama Mia! The instructor was Mariela. She patiently went through the menu with us all, a translator changing Italian to Japanese and then to English for me. The clock started ticking. We started at 10 am and lunch was to be on the table by 1:30 pm. Then the switch went on. I felt like I was on Iron Chef. 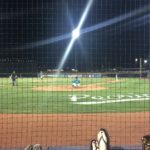 It was chaos – for a while. Pots began clamoring, students, almost in a panic, grabbed ingredients and bumped into each other, all in an attempt to put their ingredients in place for their designated recipes. The first minutes seemed uncertain, a searching for confidence, then this sense of order settled in. Dishes started to unfold. I was told to go here, and then there, do this, then that. I felt a little out-of-place hovering, assisting, chopping, straining, the only sounds being Japanese words. Some students tolerated me and some were curious. Why was I here, interrupting this “professional” class? It certainly was not what I expected but I must say I learned a thing or two. 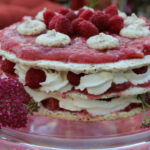 Like how to make the Torta Verdura. I had been curious about after eating it at the Festa. Made with swiss chard, cinnamon, cloves, nutmeg, candied citrus, raisins soaked in liquor, pinenuts and a little sugar. All the goodness piled high awaiting a hand mix to create the pastry. So it is a little savory, a little sweet and served as a dessert. The crust is like a pâté sucre, a sugary crust, and heavy with egg yolks. These happen to be brilliant orange – must be what the chickens eat. 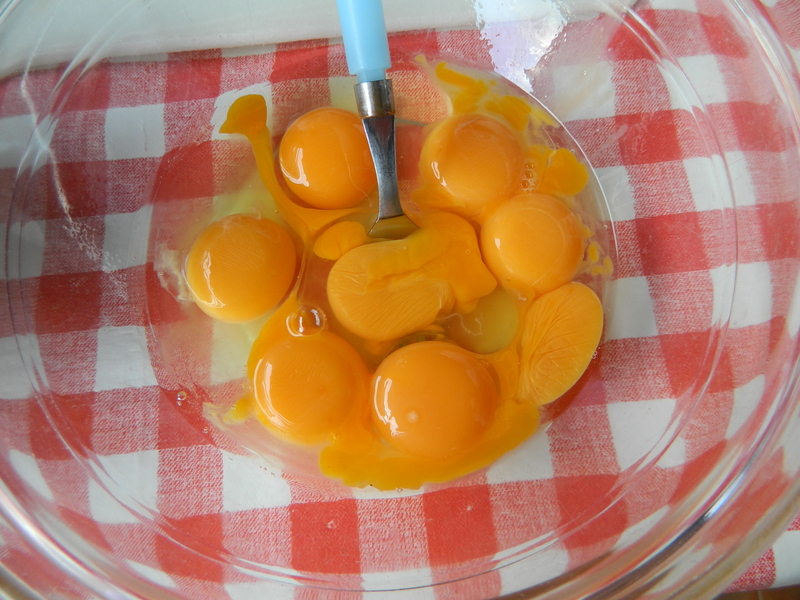 Sunset colored yolks for the torta crust. 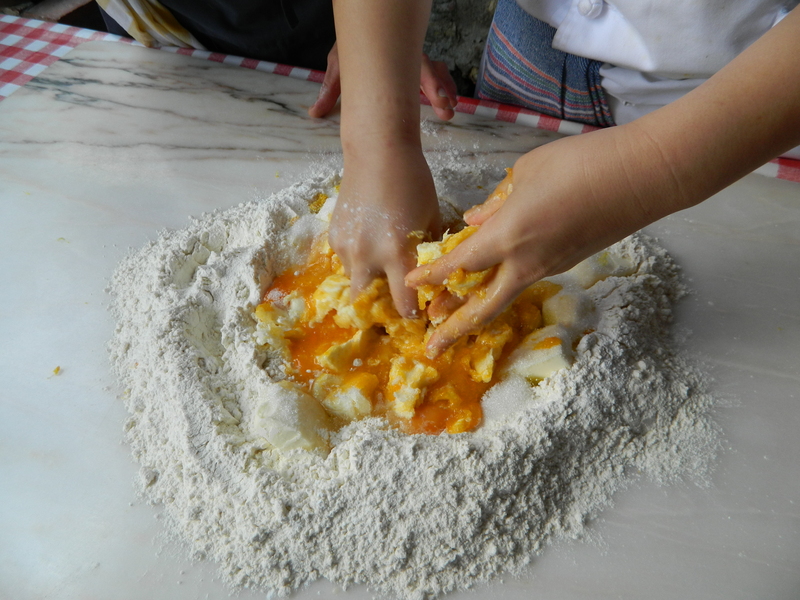 Hand mixing makes a tender crust. This is enough dough for three tortas. I learned a new technique for decorating the crust to create little “beaks” by slicing the dough on an angle, then with a knife, folding it over the dough to its right. Making a slit at an angle, then folding over the existing dough makes a pretty “beak’ decoration. 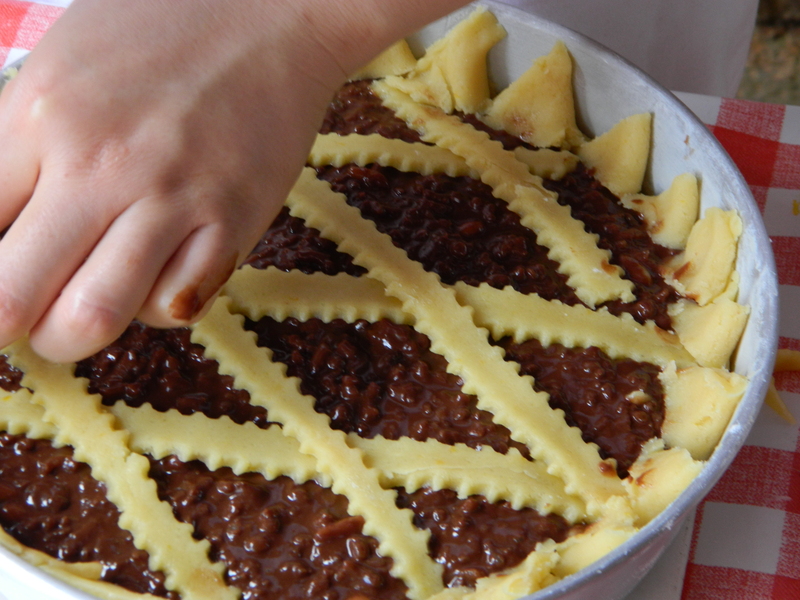 This torta, a Torta di Riso al Cioccolato, is filled with chocolate, rice, pinenuts and lemon zest. 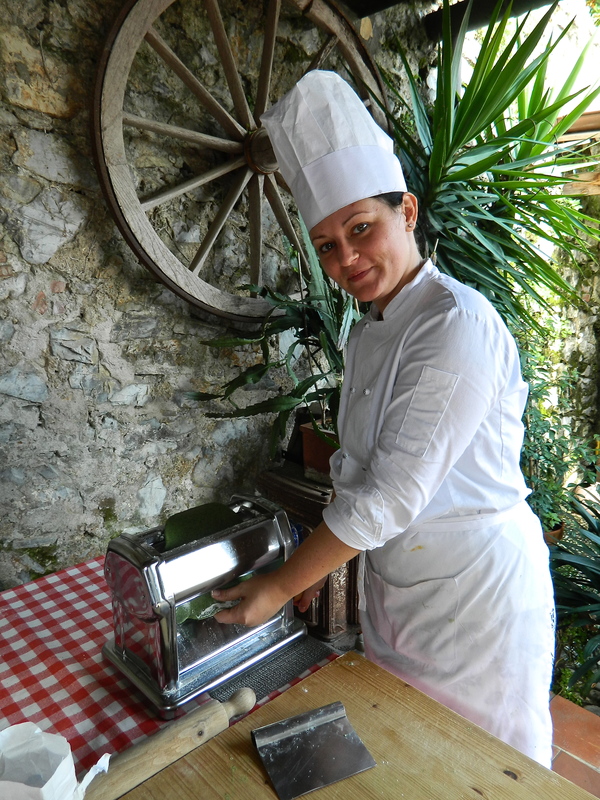 The spinach, for the lasagna, was pressed through a tami, or strainer, for extra fineness – another good tip. 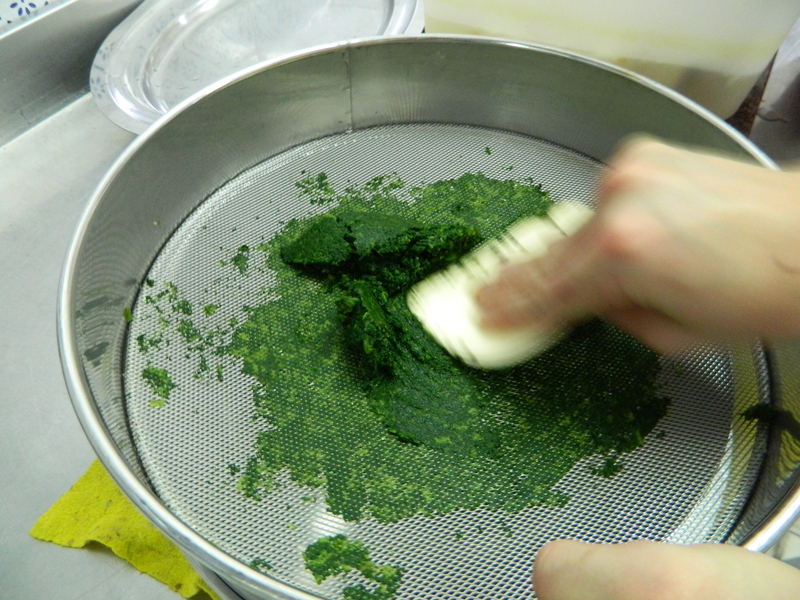 A finer pasta texture is achieved when the spinach is finely strained. This sweet Italian student became my friend. We rolled out the pasta layers outside on the patio! Mariela demonstrates the proper technique. 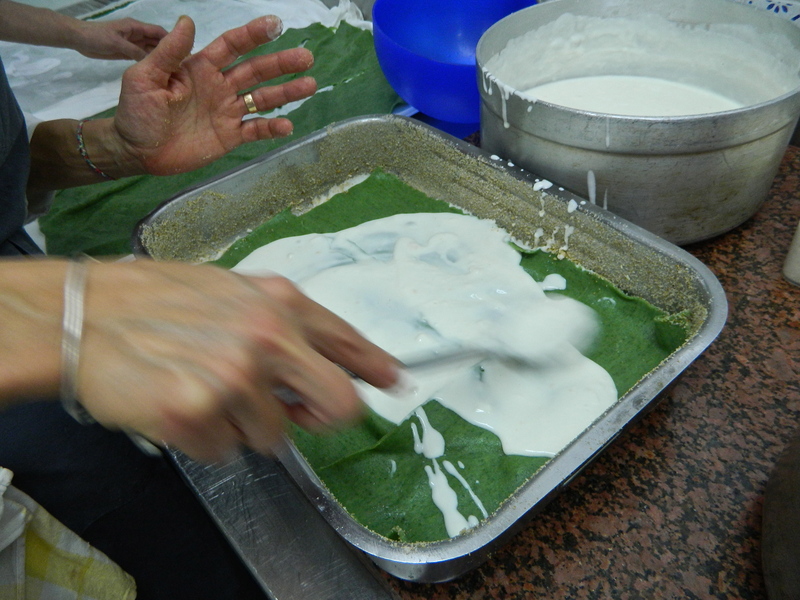 Bechamel sauce tops the spinach lasagna as the first layer. 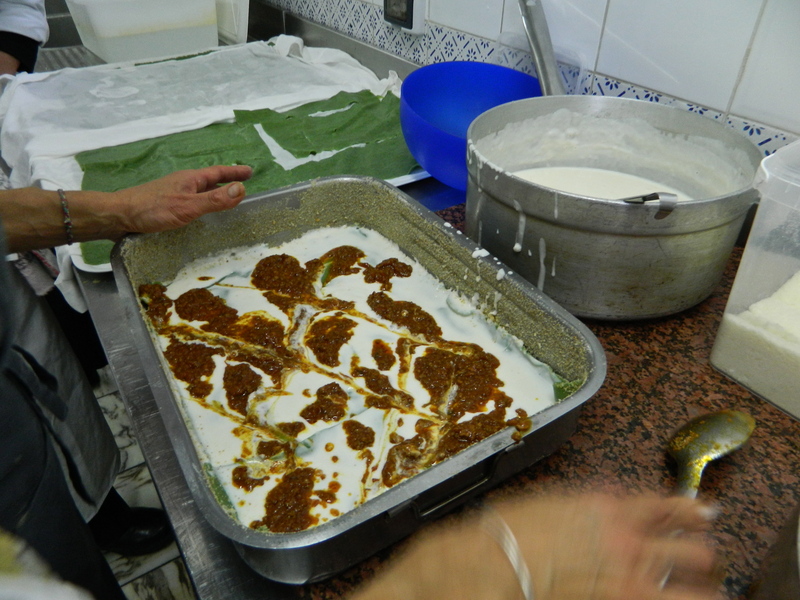 A tomato sauce is swirled into the béchamel, then the layers continue. Delicioso! 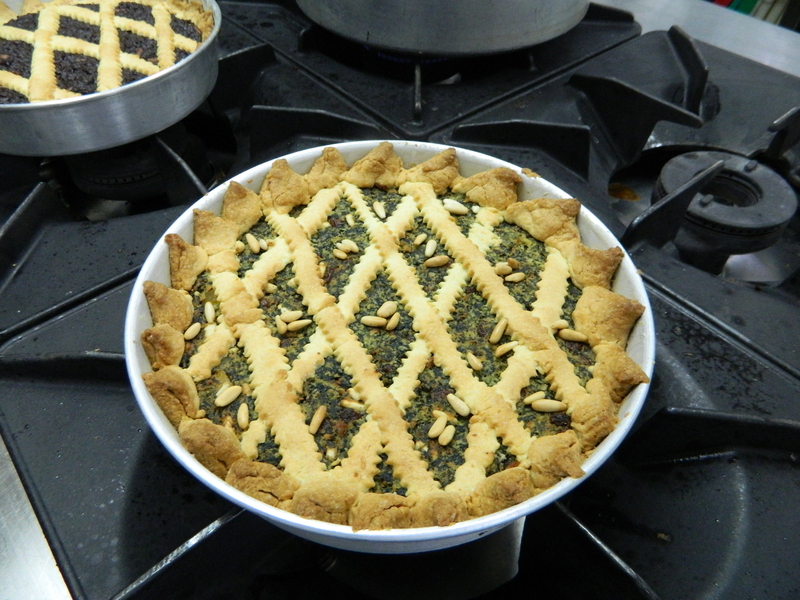 I helped make a timbale of cardoons, which when cooked, have a similar flavor to artichokes. We squeezed lemon juice on our hands to prevent the cardoons from turning them black due to the iron in the vegetable. Cardoons look like tall, fat celery. Cardoons are first stripped of their “strings” then chopped and cooked in boiling water to soften. A last-minute plating of the appetizer. Lunch was served on a lovely patio outdoors and I sat with the owner, Gianluca who has taught here for 10 years. 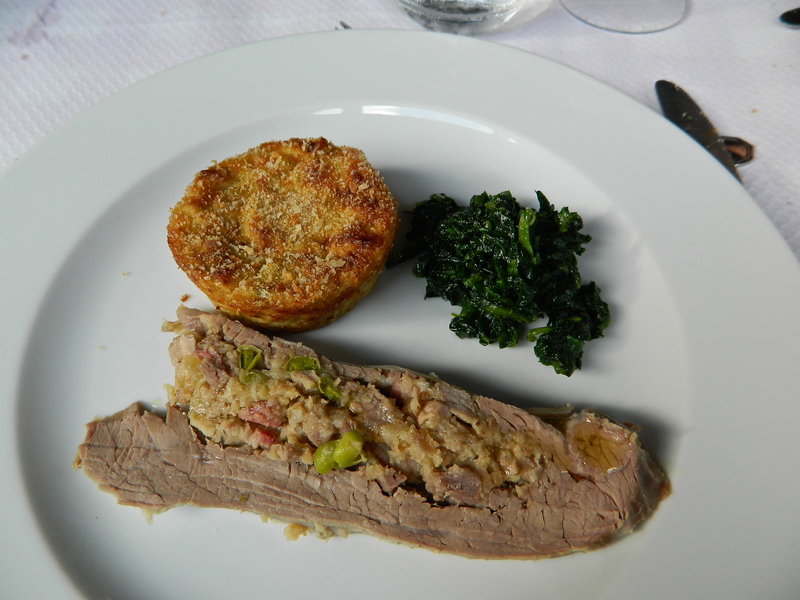 Our main course of stuffed veal roulade, cardoon custard and sautéed greens. Gianluca’s students have eight weeks of training and then are placed in restaurants all over Italy for a 10-month internship. The students are not paid but receive room and board in exchange for this opportunity to learn from master chefs. His success rate is high and the students seem to thrive on this experience. The owner and proprietor of the academy, Gianluca, turns out professional soon-to-be chefs. 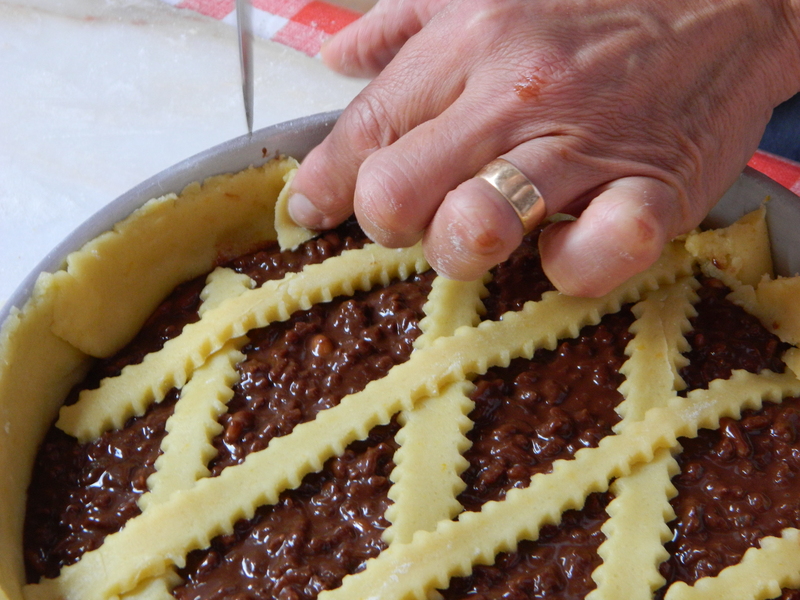 I’m working on perfecting the Torta Verdura recipe so I can share it with you. Look for it in an upcoming post! Abbandonatil all’amore e alla cucina. Love and cook with wild abandon! And that I did!